I hereby declare that it takes less time to put a roast beef dinner into the crock pot than it takes to drive to a restaurant, sit in the drive-through line, order, wait for your order, drive home, and dole out the food to your hungry family. 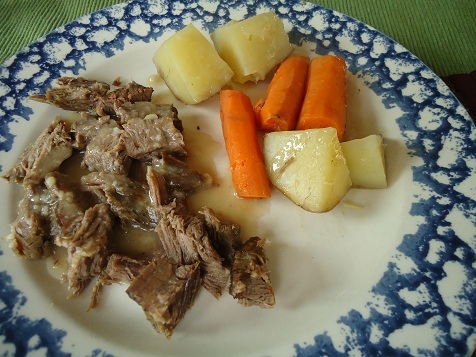 You can have a delicous, healthy pot roast dinner waiting for you at the end of the day instead of settling for take-out. Then, on the morning of the day you wish to eat your roast beef dinner, take a few minutes to scrub or peel your potatoes and carrots. (This takes me about 10-15 minutes, depending on how many I’m feeding. I usually plan for one potato and one carrot per person – then I throw in three or four more for the extra hungry among us.) Cut the veggies into fourths and put them into your crock pot. Peel and chop your onion into a few pieces and add it to your potatoes and carrots. Sprinkle in some salt. Open your package of roast and place it on top of your veggies. Salt your meat. Add about 1/3 cup of water. Put the lid on the crock pot and turn it onto “low” for about 8 hours. At the end of the day, your entire meal will be ready. You can use the broth to make gravy if you want (like this, except that you’ll use beef broth instead of turkey broth). Clean up is minimal. Food quality is exceptional. Taste is no comparison. Ahhhhh…roast beef dinner. How I adore you. I do this quite a bit. I love my crock pot and I also use my pressure cooker for fast dinners. Husband and I rarely eat out, as home cooking is better tasting and better for you! And I can, which is the original fast food. How I love to eat a good pot roast dinner. I have made my last couple roasts in the crock pot and they were so absolutely amazing. I love roast in the crockpot!! It makes the house smell sooo good! Fast food is eh…I generally don’t care for it and my kids don’t either. DH likes fast food, but would definitely choose a roast over fast food any day! We are currently experimenting with creative uses for cooked roast meat. So far we’ve enjoyed beef steak pie and sandwiches. Next attempts will be stroganoff and fajitas. But we usually just love the roast so much we eat it plain! Great minds think alike! Just before opening this email, I put my pot roast in the crockpot for dinner. @ Bethany – in our family we like beef salad. You make it using finely chopped onion, mayo, sweet pickle and left over roast beef. This is delicious on bread for a sandwich. So it is a lot like chicken salad just using beef. I tried to make pot roast last week, it was awful! What did I do wrong? Choosing the cut of meat at the store has always been a challenge for me, why I am intimidated by this is ridiculous! Any advice for choosing the right cut of meat? It is all so confusing reading the labels! Thank you for all of your wonderful ideas, menus, and encouragement! I love trying to be a Heavenly Homemaker! I’m no beef expert, but I find that the amount of marbling (little fat ribbons running through the meat) makes the most difference. Perhaps your meat was too lean? to become tender and it is leaner too. thank you for your suggestions on fat and timing, that is helpful. What I really need to know is what cut of meat do I look for? Is arm, top, I guess I need a meat 101 class!? When I am unsure what to use for a specific thing, like pot roast, I ask the butcher in our grocery store. He’s actually given me some good recipes too! Huh, now I want roast for dinner. Well, off to the store! Nobody in my house likes or eats beef, so I often make ‘pork pot roast’ using several boneless pork chops or a hunk of loin. It pulls apart after cooking just fine and still makes everything taste wonderful! Ok, I would love to get a bit of advice from any of you ladies about what brand/type of crock pot you have had liked the best and where you purchased it…the last one I owned had a digital “readout” on it, and in only a few months the crock pot totally quit working — and then on top of that, the large discount chain store I bought it from wouldn’t take it back because they didn’t have that model in stock anymore (interesting…)!! I am now very leery of buying another one — just can’t afford buying another one every few months, or even years! I recommend getting the cheapest one available — just the normal one with the knob that lets you choose warm, low and high. I have four (all different brands and sizes) and I’ve never had one quit on me. I have a Hamilton Beach with a simple dial and a Rival with built in timer. These are my 3rd and 4th crock pots. (First one became too small for our growing family, second one experienced unexplained sudden death). Get a well known, well reviewed brand in a color, style you like. Many good quality ones are available for $20-$40. I was also wondering why my crock pot burned my beautiful overnight porridge? I put it on at 10 p.m. and checked at 06 a.m. I had it set on 12 hrs low. Who has success with this version of porridge? What crock pot can I use; mine is a cheap one as well. I was very disappointed. We’ve gotten so we do not eat out anymore ever. Homemade actually tastes good while take-away is just a greasy, fatty (the unhealthy kind) mess on a plate. The thought of eating take-away actually turns my stomach! What kind of roast do you normally buy? Rump, Shoulder, Eye of Round… it is confusing to me. Threw a roast in the crock pot this morning, along with a handful of carrots, onions, celery and potatoes. Since our Azure order comes in today (right at supper time too!) We need something ready or we’ll eat out. And to make matters worse, the nearest fast food place is 20 minutes away. That means the food is cold by the time it gets home! After years of thinking it’s easier and cheaper to grab a $5 pizza or a few burritos, I’m slowly learning that it just takes a little forethought and I can have a good meal ready for me at home after church. Still haven’t fully gotten out of that grab and go trap, but I’m working on it. Food made at home tastes so much better! And my crockpot is being used more and more lately. Believe it or not, dusting your meat with cornstarch (maybe a teaspoon for the whole roast) and a little brown sugar (again, maybe a teaspoon for the whole roast), makes your meat taste like it’s been browned, and turns the juices into a nice, light gravy. I’ll have to give that a try Jane. Thanks for the tip. I love using my crockpot. 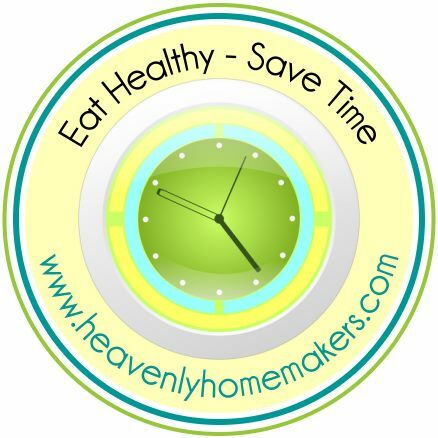 I find that in the evening I often have time to cook and eat or plan and cook, so if I don’t plan before I won’t get to eat on time at home. Crockpots are great for implementing that plan in the morning. How do you have this ready after church?? Do you cook it overnight or get up really early? Thanks for replying…Is the process the same as the crockpot, only 1/3 cup of water or do you have to add more in the oven. Also, I don’t own a roaster would a casserole dish covered with foil work??? Thanks!!!! I do it the same as I do a crock pot. Yes, a covered casserole dish would work great!